Don't Feel Like Reading The Complete Porter Cable Cordless Drill Review? Here Is A Quick Summary. Both the Porter Cable cordless drill & impact driver have 20-volt lithium-ion batteries which ensure a longer runtime. The PCCK604L2 model has a powerful motor delivering up to 1500RPM with variable speed triggers for ultimate drilling precision. This Porter Cable power tool set also has a convenient bit storage area and LED light illumination and is backed by a 3 year limited warranty. 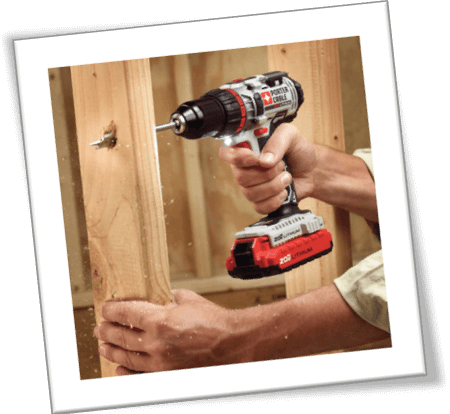 A cordless drill is an essential tool you need to have in your arsenal for your DIY chores around the house or as a professional contractor. Getting the best power tool for your requirements enables you to work comfortably and swift. Furthermore, by using a cordless drill you will have no interference with tangling cords, and you will be able to work in tight and enclosed areas deprived of any inconveniences. However, there are so many cordless drills available in the market today. So. Choosing the best drill that meets your requirements and budget can be quite a daunting task. Especially if you’re new to cordless drills and don’t know what to look for, including relevant features and qualities. Well, in today’s article, we are going to have a closer look at one of the PORTER-CABLE cordless drills. This PORTER-CABLE PCCK604L2 drill/driver review will provide you with everything you need to know when it comes to picking the best cordless drill. To select the perfect dril, there are a few things that you have to take into consideration. First, you need to consider the power – check the motor which has been implemented in your power drill. If you intend to use the drill to carry out heavy-duty tasks, we recommend choosing a cordless drill with a high RPM. Another important feature you need to consider is the ergonomic design. It should ensure smooth, comfortable, and hassle-free use. Also, having a compact design is helpful especially when working in tight spaces. Other features you need to consider include; the battery, the maximum torque the drill delivers, chuck size, drill speed, housing, LED light, and others. To make it much easier for you to decide, we have prepared a comprehensive PORTER-CABLE PCCK604L2 Review. Whatever your needs might be, look no further, the PORTER-CABLE PCCK604L2 20V Max Lithium-Ion 2-Tool Combo Kit is an incredible tool worth considering without even when on a tight budget. From standard, everyday drilling to high-impact drilling, this Porter Cable combo kit comes included with everything you need to get the party started. At only 3 and 1/2-pounds, this Porter Cable cordless drill is incredibly lightweight and extremely easy to maneuver into tight and enclosed areas for precise drilling. Besides this Porter Cable 20v drill being incredibly lightweight, it also sports ergonomic design and soft grip, LED light for night-time drilling/driving, and a bit of storage space for some added heads. Honestly, this Porter Cable toolset is worth every penny. Let’s digg a little deeper in our PORTER-CABLE PCCK604L2 Review and see if this tool is the best fit for your needs. The PORTER-CABLE PCCK604L2 is the best driver combo kit for your money. This power tool offers tremendous power and a longer run-time all in one tool. Even for the heavy-duty DIY projects, this machine stands out on his own. It has magnetic bit holders that are conveniently located on the crest of the unit. Additionally, it comes fitted with 20-volt Lithium-ion batteries. And for an incredibly low price, you get two separate tools which can get you out of any troubles you may encounter when working on your home. One thing that we liked about the PORTER-CABLE PCCK604L2 is that it features variable speed control that enables you to drill/drive in a wide variety of materials. Despite this power tool featuring variable speed control, it also has a two-speed transmission. This compact cordless drill is capable of attaining 1500 Maximum RPM under no load condition. At low speed, this Porter Cable drill can deliver 0-450RPM. When you compare DeWalt drills vs Porter Cable, you will see that both cordless drills feature two-speed transmission – both offering 0-450RPM at low speed and 0-1500RPM at high gear. Hence allowing you to select the speed that is suitable for the surface which you are working on, ensuring that you don’t damage anything. Overall, there is not much difference between Dewalt drills and Porter cable regarding performance. What's more, the PORTER-CABLE PCCK600 features two-speed settings: 0-400RPM at low gear and 0-1600RPM at high gear. Practically, the PORTER-CABLE PCCK604L2 is not going to work as fast as the drill in the porter-cable PCCK600 combo kit. But that doesn’t mean it’s not powerful enough to get the job done no matter what condition you are facing. Additionally, this Porter Cable cordless drill model offers a clutch option that allows you to change between high and low-speed settings swiftly. The trigger is conveniently placed on the unit, so you won’t have to take your hand from the handle to adjust the speed. Instead, you only need to press the trigger gently if you want low speed, and when you push the trigger harder, you will increase the speed of the drill. This Porter Cable combo kit comes with a drill and a driver. Both tools are equipped with 20-volt lithium-ion batteries, which are powerful enough to deliver 283 units watts of power. When you compare the performance of the DeWalt vs Porter Cable, you will notice that performance of the Porter Cable drill is slightly less, since DeWalt offers up to 300 units watts power. This Porter Cable combo kit might not be the most dominant drill/driver available on the market, but it still delivers more than enough power for standard chores. Additionally, the lithium-ion batteries included are heavy-duty, so they will hold a charge for an extended period and last you charge after charge. This makes it incredibly useful for those who prefer working swiftly without charging the tool frequently. Moreover, the installed battery gauge lets you know the remaining charge left. Furthermore, this power tool sports a 1/4-inch impact driver and is capable of delivering up to 1450 in. lbs of torque, more than the Makita cordless drills. Also, it provides a top speed of 0-2800 RPM and 0-3100BPM, hence making it ideal for any drilling and driving task you may encounter. You can use the clutch settings to adjust the torque that is being used. The two 20-volt Lithium-Ion (Li-Ion) batteries in this combo kit feature a smaller capacity of around 1.3Ah. These batteries are more lightweight than the traditional NiCd batteries and have a longer runtime. The impact driver is slightly heavy, weighing 3.3 pounds and is 6.9-inches long, which makes it one of the more significant drivers compared to DeWalt and Makita cordless drills. Most people like using Porter Cable tools since they are snugly build – this unit features a very soft and comfy handle, which makes it much easier for you to work in tight and enclosed areas without getting fatigued. The PORTER-CABLE PCCK604L2 comes with a 1/2-inch keyless metal ratcheting chuck which offers superior bit control. It has a convenient bit storage area, so you will not have to worry about losing the bits when changing them. It also has a belt loop, where you can conveniently keep bits and other attachments. This PORTER-CABLE cordless drill also has built-in LED lights which illuminate the area in front of your drill, allowing you to see what you are drilling even in low-light settings. Furthermore, this power tool features a 24-position slip clutch, over double that of the Black and Decker drills. It comes included with a kit bag – perfect for storing the tools which are included in this combo kit. All Porter-Cable products come backed by an outstanding warranty, and the PORTER-CABLE PCCK604L2 is no exception. PORTER-CABLE provides a three-year limited manufacturer warranty on the drill and a two-year limited manufacturer warranty on the batteries. Both the warranties protect against any defects in material and workmanship, but not in case of tool misuse or abuse, which is the industry standard. Both tools are compact and lightweight reducing user fatigue. Boasts outstanding impact mechanism – delivers 1450 in. Lbs at 2800 ROM and 3100 BPM. Powerful motor – capable of delivering 1500 RPM. It has 20-volt lithium-ion batteries which ensure longer runtime. The non-slipping handle offers a better grip when in operation. Variable speed triggers for ultimate drilling precision. LED light illumination when working in dark conditions. Batteries take less than 60 minutes to be fully charged. Has a convenient bit storage area. Comes backed by a three-year limited warranty. The magnetic driver holder requires some improvement. Some users claim that the drill runs a bit noisier than the others. The battery life might be disappointing sometimes. After reading through our Porter-Cable cordless drill review, it’s time to make an informed decision. So, if you are looking for something for drilling and impact drilling, then the PORTER-CABLE PCCK604L2 20V Max Lithium-Ion 2-Tool Combo Kit is here for you. This impact driver is inexpensive, making it a perfect choice for those on a tight budget, but still something of excellent quality. This kit comes with two 20 volts batteries included in its price, so you don’t have to purchase them separately. Therefore, making it a great value for your money. Furthermore, with this Porter cable cordless drill device, you can spend an extended period of time without experiencing hand fatigue, thanks to its compact and ergonomic design. 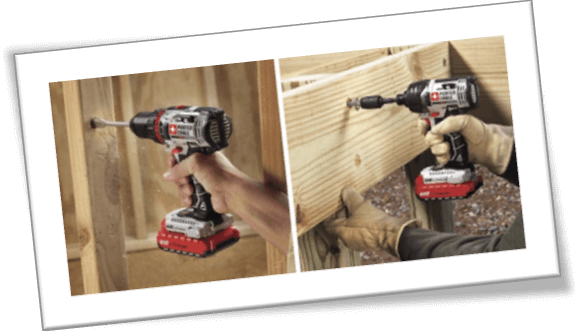 Both the drill and the impact driver allows you to do wood drilling, metal drilling, and various fastening applications. Also, you can get to work on drywalling and even placing decking screws. Overall, the PORTER-CABLE PCCK604L2 20V Max Lithium-Ion 2-Tool Combo Kit is an excellent power tool that you don’t want to miss out on. If you want to find out more about the PORTER-CABLE PCCK604L2 and what other customers are saying, check out the reviews on Amazon, and don’t forget to purchase one of the Porter-Cable combos this holiday. Still not sure if you should buy the Porter Cable cordless drill ? Make sure to check out our in depth cordless drill buying guide or compare the best cordless drills in this drill comparison review, hope this helps you make an informed decision when still in doubt.